For those gutter jobs that do not have fascia installed. Every gutter company needs an EM 5½" Fascia Gutter Machine for those gutter jobs that do not have fascia installed; a 5½" fascia gutter is commonly used with 2x4 trusses. Our 5½" fascia gutter machine features unique and fully driven forming stations that are enclosed with a steel cover to protect the operators and keep the roll-former free and clear of debris. All bearings are factory-sealed. Eastside fascia gutter machines are driven by a powerful 1.5HP, 110-volt single phase motor and are constructed of heavy gauge steel. The EM 5½" Fascia Gutter machine is completely enclosed, and has removable side panels for serviceability. The machine is powder-coated inside and out with a heavy-duty industrial paint finish for protection and features industrial nitrocarburized (QPQ) steel rollers. Nitrocarburizing rollers allow for improved wear, lubricity, strength and corrosion resistance. 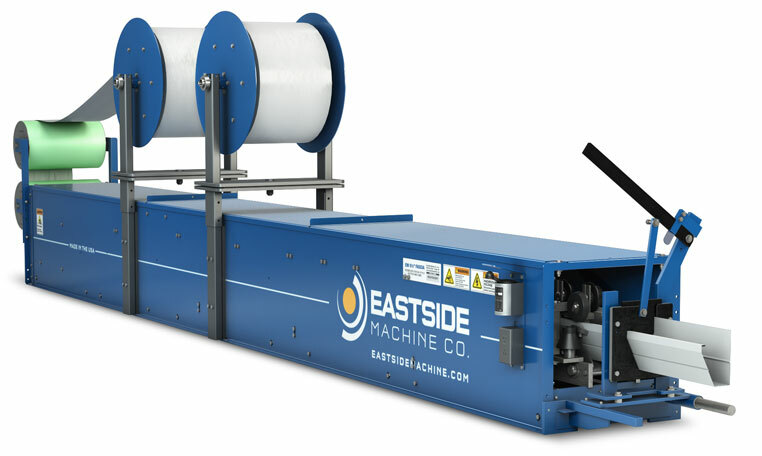 Eastside Machine Company's portable seamless gutter machines come with operational training and technical support and an industry leading 5-year limited warranty. Eastside Machine Company's EM 5½" Fascia Gutter Machine is a must-have machine for those jobs that need gutters but don’t have or want fascia. Like all Eastside Machines, our EM 4½-inch Standard Fascia job site machine is built tough and is proudly made in the USA. We look forward to providing our high-quality services to you: training, machine adjustment and maintenance, sales and marketing programs, accessory and coil sourcing or custom work. Whatever the need, we are here to assist you and help expand your business. For a quote or custom quote on an Eastside roll-forming machine, simply submit a request on this page or call 1-800-234-7834 . You can also reach us by email us at info@eastsidemachine.com and check out our Facebook and Google+ social media pages. Looking for more options in seamless gutter job site and in-plant roll-formers? 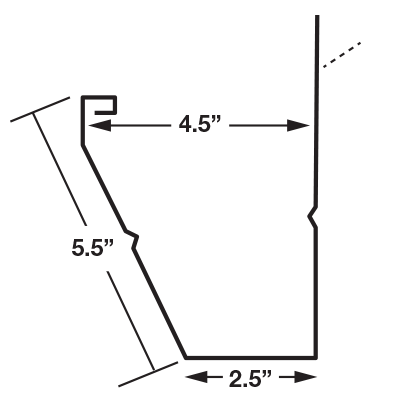 Check out our Specialty Page, we offer profiles like the Super Fascia Seamless Gutter Machine (4 ½ x 2 ¼ x 19), Curved Round Fascia Seamless Gutter Machine (4 ½ x 2 ¼ x 15) and Half Round Seamless Gutter Machine in both 5-inch and 6-inch. 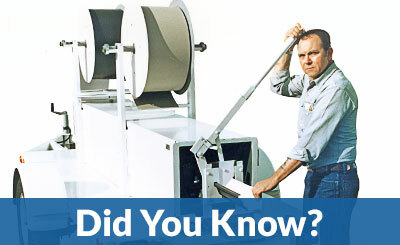 For a quote or custom quote on an Eastside roll-forming machine, simply submit a request below or call 1-800-234-7834. You can also reach us by email us at info@eastsidemachine.com and visit our Facebook and Google+ social media pages. Eastside Machine works with lease and finance companies that know and understand our specialty products. We have years of experience and strong relationships and we will work to get you a financing program that will work for your business. Eastside Machine Company offers a multi-profile guillotine cutter with an industrial nitrocarburized steel blade for a very desirable, clean cut. The durability of the blade allows it to keep its sharp cutting edge, which minimizes maintenance; think of an Eastside Machine guillotine cutter as comparable to the Ginsu knife's role in a kitchen. The Trunion Mount Coil Cradle is an optional accessory on most Eastside portable seamless gutter machines. It allows the coil to be rotated to take advantage of coils that are painted on both sides without the need to remove and flip to change the color. The Trunion Mount Coil Cradle weighs 75 lbs each and two are typically purchased. Purchasing a seamless gutter roll-forming machine from Eastside Machine Company and need a trailer? We can assist you! Even though the majority of our portable gutter machines are sold without trailers, we would be happy to help you purchase the perfect trailer for your new gutter machine. Just ask customer service, and we would be glad to give you a quote on our recommended trailer for our portable seamless gutter machines. 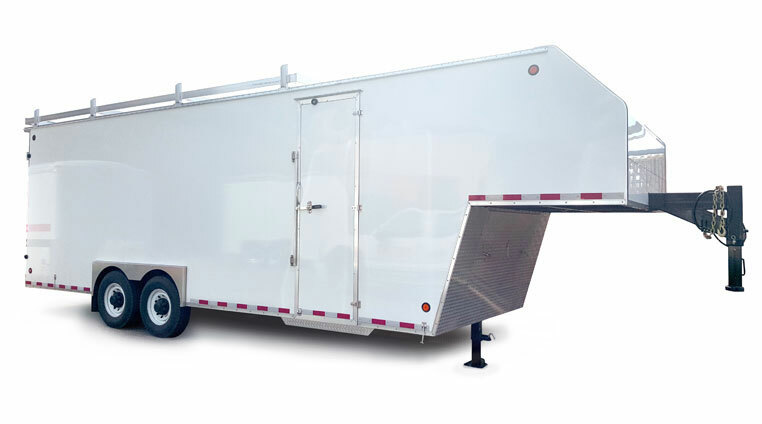 If you choose to purchase your enclosed seamless gutter trailer from Eastside Machine, we can also offer you custom graphics design and installation for your trailer. 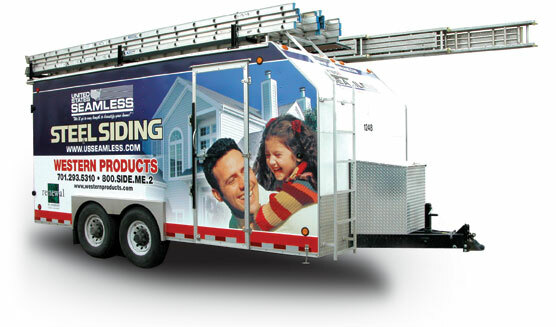 Our in-house marketing department will work with you to create a truly eye-catching portable siding machine that is a key profit area for your business, and also serves as a billboard. To learn about our dealer programs, marketing, graphic design and install opportunities, ask one of our customer service team members or our sales associates. Whether you are already in the seamless gutter business or just starting out, have you ever considered partnering? We have a gutter and leaf protection dealer program that might be the right fit for your business. Leafaway® is a seamless gutter and leaf protection dealer marketing program that is in its early stages of coast-to-coast expansion. Our goal is to have 30 of the 50 states covered by 2019. To learn more about Leafaway, contact Customer Service at 1-800-234-7834 or click here to go to the Leafaway website. Wait…there’s more! Looking to expand your gutter business? We invite you to explore the opportunities to grow your business with a United States Seamless® dealer program. United States Seamless, Inc. is a leading home improvement dealer opportunity for seamless steel siding, accessories and seamless gutters products. We're a goal-oriented company looking for self-motivated individuals within the home improvement or construction industry who can see themselves growing their business by partnering with a proven affiliate dealer program centered on best practices, great products and a reputable brand name. Coil Widths: 14" or 15"
The field nickname for the original Beymer gutter machine is the "The Iron Horse".